Anecia Toyukak helps her husband, Mike, look at the ballots in Manokotak on Aug. 16, 2016. Before choosing a primary ballot at polling place set up at the Manokotak City Office this week, Mike Toyukak glanced at two sample ballots offering Yup’ik translations of the English ballots available for voters to chose from. From signing for his ballot to depositing it into the ballot box, it only took Toyukak a few minutes to vote. But the scenario he encountered – the Yup’ik language sample ballots, a translator on hand had he needed one, and even a Yup’ik glossary of terms available for the poll workers to refer to – were years in the making. And Toyukak was at the heart of the change. His first language was yup’ik. In the past, when he went to vote he was confronted with an English ballot, and difficulty understanding all the nuances it contained. Although he knows some English, he also knew that others were having an even more difficult time with the language. So in 2013, the Native American Rights Fund filed a lawsuit against the state on behalf of Toyakuk and others, including the Togiak Traditional Council, asserting that any election information provided in English should also be provided in Yup’ik, Gwich’in and Inupiaq. They won the voting rights case, and after a lengthy settlement process, in 2015 the State of Alaska agreed to provide a dozen language assistance provisions for 29 communities at each election through the 2020 general election. On primary day this year, that meant language assistance was provided in more than 100 communities around Alaska, including the 29 identified in the Toyukak settlement, which are in the Dillingham, Kusilvak and Yukon-Koyukuk census areas. Lt. Gov. Byron Mallot and others from the state traveled to Manokotak to hear from Toyukak. Through a translator in Manokotak on Aug. 16, Mike Toyukak said after he voted that he was glad to see the changes come to fruition, and help people in his region vote. When the ballot was harder to understand, people were less likely to go vote, he said. Lt. Gov. 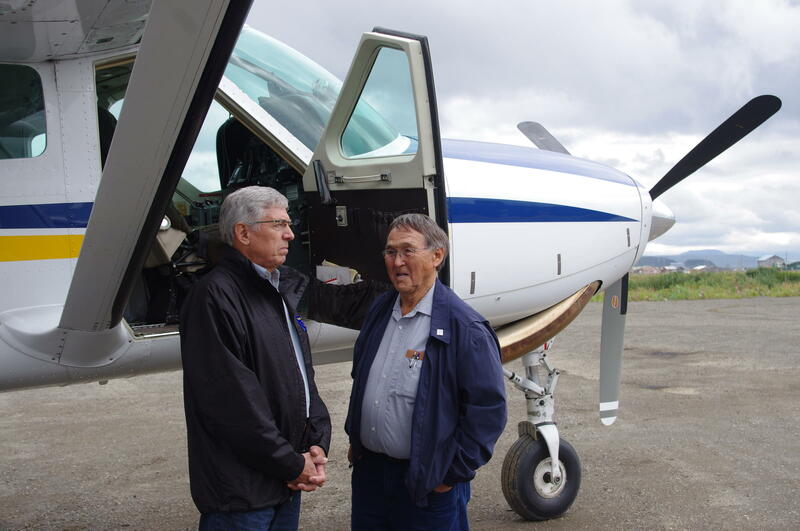 Byron Mallot talks to Joe Chythlook before boarding a plane on August 16, 2016, in Togiak, Alaska. 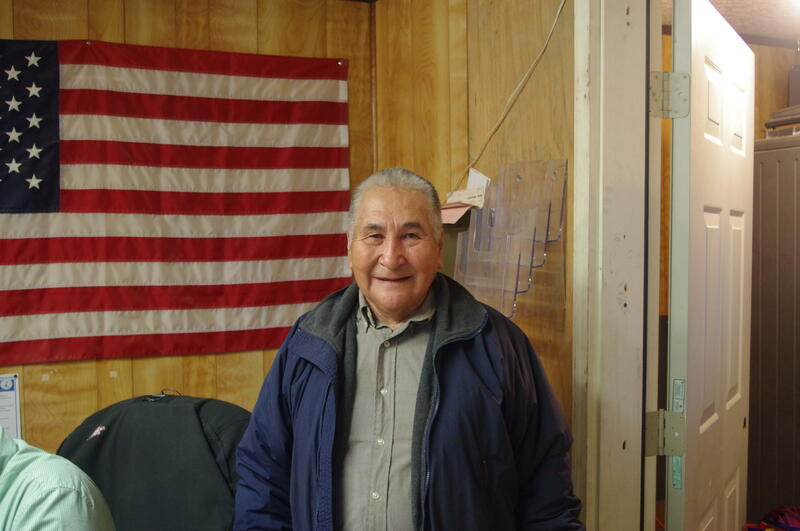 Then, Mike and his wife Anecia traveled along with those visiting for the election to two other Bristol Bay villages: Togiak and New Stuyahok, to see how things worked there. 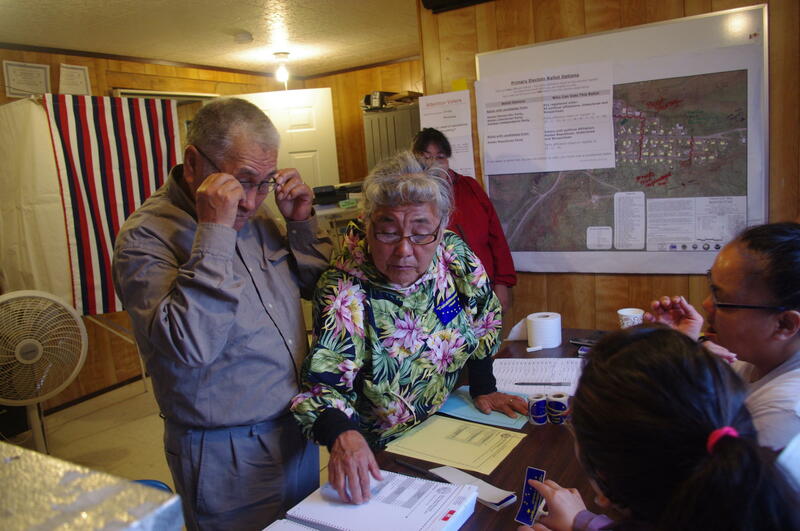 In each town, they saw at least one or two people get help voting – whether they looked at a Yup’ik sample ballot or had someone read to them in Yup’ik. In those villages primary day, all of the assistance requested was in Yup’ik. Mornings at many village voting sites are slow, and Manokotak and Togiak were no different, with a slow trickle of voters, including first-timers who had grown up speaking English, and elders who spoke only in Yup’ik at the poll. In New Stuyahok, six had requested help by mid-afternoon, said elections worker Anita Gust. 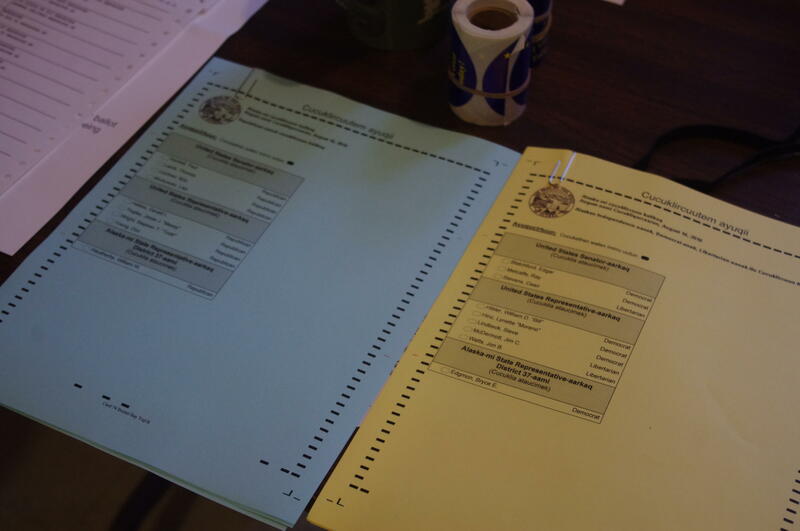 Sample ballots in Yup'ik are pictured at the Manokotak polling site on August 16, 2016. Some communities had sample ballots in Yup'ik for the primary as a result of a settlement in a lawsuit brought against the state in 2013. Although the materials available in New Stuyahok, Togiak and Manokotak were all the same, polling places in other communities had differently-tailored materials and translators with region-specific language abilities. The provisions included the Yup’ik glossary, which includes seven dialects: Bristol Bay, Chevak, General Central, Hooper Bay, Norton Sound Kotlik, Nunivak and Yukon. 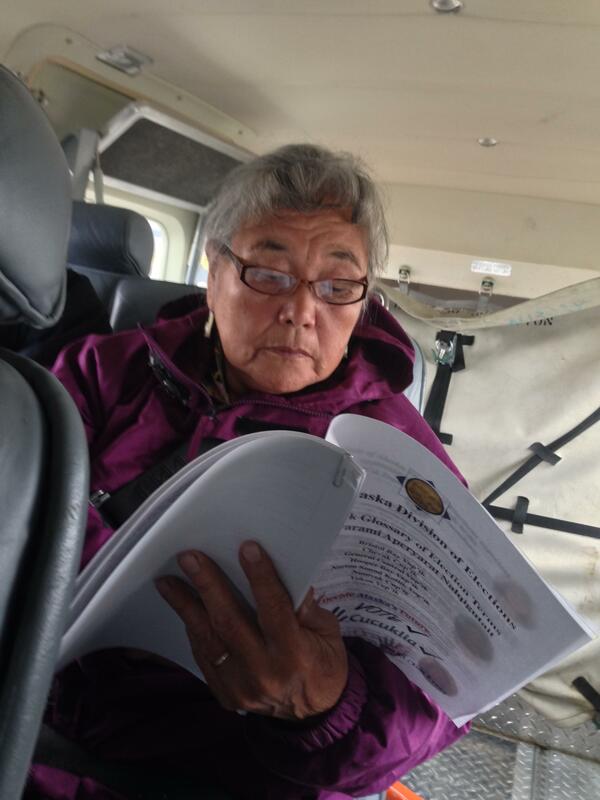 Anecia Toyukak looks through the 2016 Yup’ik Glossary of Election Terms while flying from Manokotak to Togiak on August 16, 2016. Anecia helped create the glossary this spring as part of the state’s Yup’ik language panel. The glossary was created as part of the settlement of a lawsuit her husband, Mike Toyukak, was a plantiff in that sought more language assistance for Yup’ik speakers during each election. Toyukak wasn’t just the reason for the change. He and his wife Anecia were on the Yup’ik language panel this spring that helped draft the Yup’ik glossary. Through Chythlook, he explained that the goal was to make sure every Yup’ik speaker could understand the translations, not just people in one region. The final version of the glossary reflects that. For many terms, like alternative voting methods and assistance, and even ballot: there are four different translations, depending on the region. During the conversation in Manokotak, Lt. Gov. Byron Mallott said the state wanted to provide that sort of access to the process for all Alaskans. For now, it’s just available in some communities, dictated by the settlement. As the state prepares for elections this fall, and into the future, they’ll look at possible expansions, as well as improving the process that was used this time around. “In the November election, the ballot is going to be much more complicated,” Mallott said. “So hopefully, we learn from this election what we need to do better in November, and what we need to do going forward into the future. The November ballot will include ballot measures, not just candidates, which means more words and ideas for voters to decipher. Election materials, like the voter pamphlet, will also go out in Yup’ik and other languages. After the primary election, Mallott met with federal observers to debrief, and said some additional changes will be enacted for future elections. 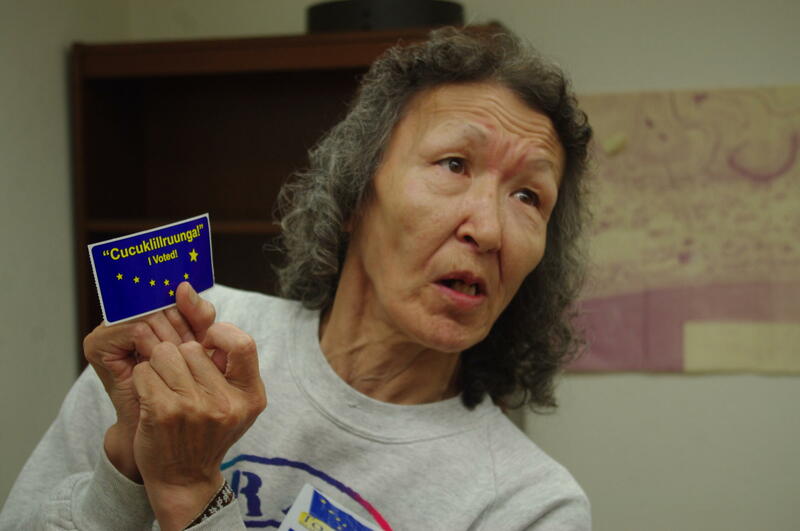 Sally Williams uses a sticker that says cucuklillruunga, or "I voted" in Yup'ik to teach the phrase at the Togiak voting site on Aug. 16, 2016.